One of the joys of being on a ski holiday is how healthy it makes you feel. The beautiful scenery, the mountain air and the physical exertion of skiing. After the stresses and strains of a hectic home and work life it is also important to relax in order to feel truly well. 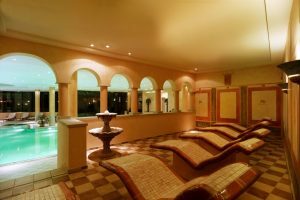 Several of the hotels in Klosters have wonderful Spa and Wellness areas so why not dedicate some of your time to taking advantage of these fabulous facilities. The hotels with the best Spa and Wellness areas are the Vereina, Piz Buin, Alpina and Silvretta and you don’t need to be staying in any of them to be able to use their facilities. 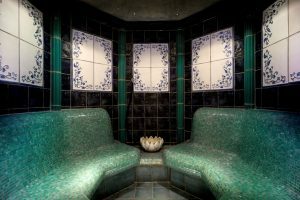 They all have swimming pools and offer a variety of saunas, steam rooms cosmetic treatments and massages. The Roman Spa at the Vereina is particularly lovely with its magnificent mosaics and vast space, spanning some 1000 square meters. Equally the Piz Buin has a fabulous spa which was completely refurbished prior to winter 2015/16. There is also the possibility to do yoga in Klosters and so if that is something that you would like to incorporate into your holiday then we can help with that too. Naturally each hotel has something different to offer and with our detailed knowledge of Klosters we can help you plan some spa time which is going to suit you best. Call us now on 02077365557 and we would be delighted to help you put together a wonderfully relaxing holiday.